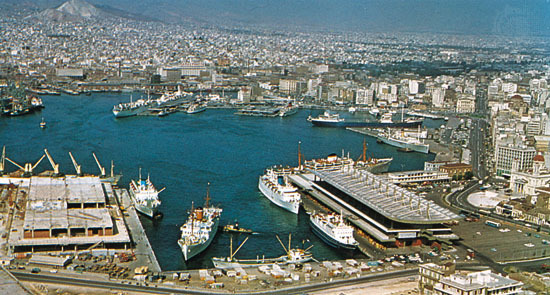 Piraeus boasts Europe's largest passenger port. The port handles 20 million passengers each year including those commuting between Salamina and Perama. The facilities at the port have been recently refurbished and the quality of the amenities improved significantly. These include ATM machines, currency exchange service, restaurants, bars, taxis and a wide range of travel agencies selling ferry crossing tickets. Piraeus has been the port of Athens for thousands of years. The vibrant city, built on top of the ancient city, is a principal nautical and financial hub, with boats linking Athens with the major Greek islands and numerous other countries in the Adriatic. Piraeus is situated southwest of Athens, about 11 km / 7 miles from the town's centre, and is connected to the city by the metro of Athens and bus services. Port of Piraeus Information: Ferry Services- Piraeus, Attica, Greece The port operates ferry crossings to Crete, the Cyclades, the Dodecanese, the eastern part of Greece and a large part of the northern and eastern Aegean. Minoan Lines, Anek Lines, Super Fast Ferries, Blue Star Ferries, and Hellas Flying Dolphins all operate from this port. Hellas Flying Dolphins provides the more expensive and faster services from the Port of Piraeus. These vessels can reach a maximum speed of 42 knots, although during bad weather conditions the service is not always available. Anek Lines provides services from Piraeus to the following: Chania, taking 8 hours, 30 minutes; Rethymnon, taking approximately 9 hours, 30 minutes and Heraklion, taking approximately 8 hours, 30 minutes. Minoan Lines Ferries also provides sailings to Heraklion on board new superior vessels. There is a daily sailing taking seven hours. Other destinations from the Port of Piraeus include the less known islands of Antikythira, Gytheion and Kythira, which are all operated by Anek Lines Ferries. The number of crossings is reduced during the winter months.